Tigerino Crystals cat litter has a new package design. It's still the same top quality litter, just with a new look! Please note: During the change-over period your order may include both the old and the new package design. Tigerino Crystals Fresh is a clumping silicate cat litter. It is made from silica gel which can absorb up to 200% and it has a gentle baby powder scent. The countleΒ micro-pores in Tigerino Crystals Fresh help to prevent bad smells from developing. These unique micro-pores are also able to absorb huge quantities of liquid and odours. The odour molecules stay bonded and the moisture evaporates. 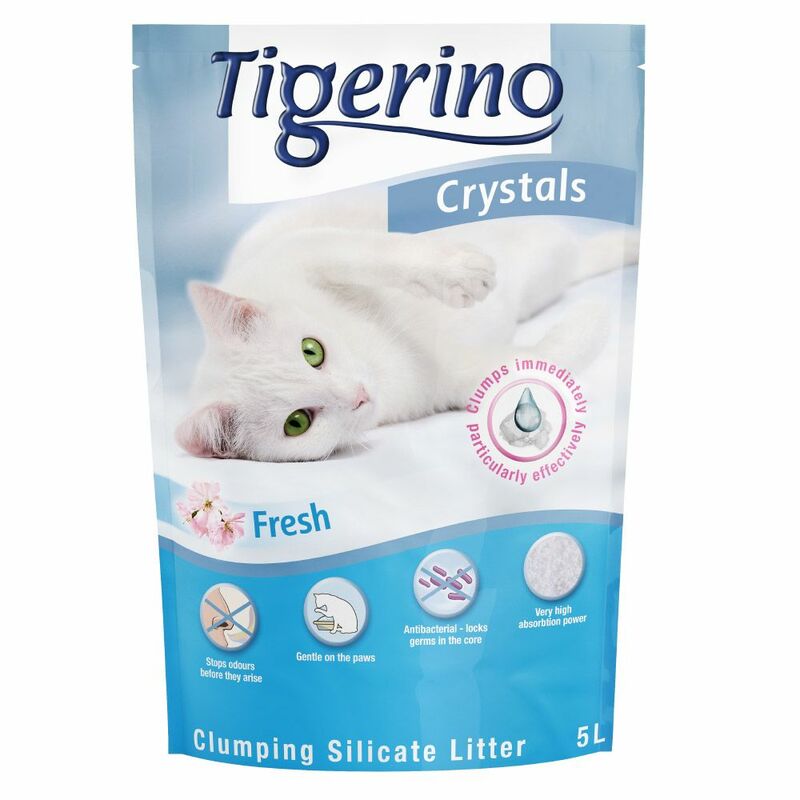 Tigerino Crystals Fresh has a clumping action with over 200% absorption power so the remaining litter remains dry and fresh. Unlike traditional silicate litter, it is no longer neceΒary to stir this litter ever so often. Clumps should be removed regularly with a litter scoop. This helps to keep cleaning and filling the litter tray to a minimum. Tigerino Crystals Fresh stays fresh much longer thanks to the extreme absorption power. And you won't notice nasty smells either. The hygienic white litter has a delicate baby powder scent which is activated when wet. It is 100% dust-free and won't stick on your cat's paws so there is no tracking and your home stays clean. The fine, almost sandy grains are very gentle on your cat's paws. Tigerino Crystals Fresh Clumping Silicate Cat Litter at a glance: Combines the advantages of traditional clumping litter with silicate litter Immediate clumping action with over 200% absorption power Stops odours in seconds Anti-bacterial - seals germs inside the core Kind to paws Light in weight Dust-free, easy to use Light in weight and very long lasting The cat litter tray should be placed somewhere warm and dry. The micro-pores immediately absorb moisture so the litter tray stays clean. In very rare instances your cat might not take to Tigerino immediately. You can mix Tigerino Crystals with your old litter, but this can influence the effectiveneΒ. Yield: 1 cat approx. 1 month 2 cats approx. 3 weeks 3 cats approx. 2 weeks Instructions for use: 1. Fill the clean cat litter tray with approx. 4cm of Tigerino Crystals Fresh clumping silicate litter 2. Remove soiled clumps and faeces at least once a day for long lasting cleanlineΒ. The litter remains hygienic and clean, there is no need to stir through 3. Dispose of soiled litter with your household waste or according to the local regulations. Never dispose of Tigerino Crystals Fresh Clumping Silicate Litter in the toilet 4. Dispose of the entire contents of the litter tray approx. once a month.